Believe it or not, balancing a healthy lifestyle with family life is relatively easy, once you get into the swing of it. I have first hand experience there! The hardest part is certainly getting started. We seem to live in a time, where people find themselves caught up in cycles of unhealthy habits, which can be tough to break. But keeping active and remaining an active member of your family is doable! Furthermore, not only is it achievable, but in a world where childhood obesity rates are on the rise, it’s crucial that we as parents lead by example, and prioritise our own physical and mental wellbeing as role models for the younger generations. During my first pregnancy I remember people telling me all the things I’d never be able to do again, ‘I’d never sleep again’, ‘never run as fast’, ‘never wear a bikini’, ‘never be as confident’…etc and as a person who has always embraced fitness, this wasn’t encouraging to hear. Of course I understand that once you have children they become your priority and I support this entirely, however, when I heard these comments I began to wonder whether becoming a parent meant I had to loose a part of myself in the process? I am happy to confirm, two children in, that this in fact, false! PHEW! Contrary to what the fear-mungers would have you believe, you can still regain a sense of self and be a good parent! So, how to find this balance? 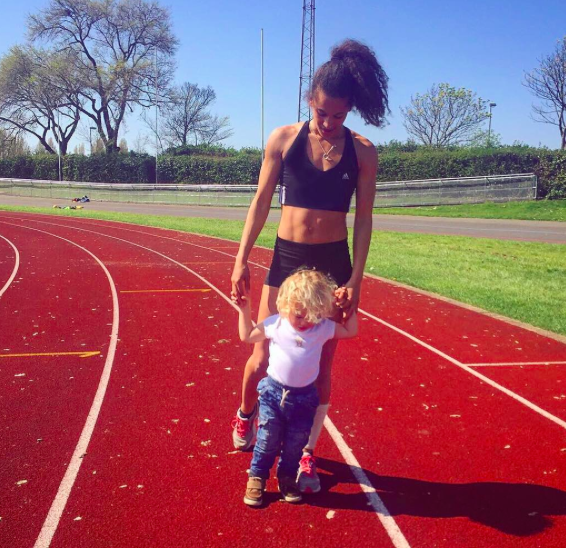 Whether it’s fitness, work or relationships… finding a balance of time for yourself and time with your family can seem tricky, but here’s my 5 top tips to make it work! This is possibly the most important factor when planning in a workout routine around family life. Gone are the days when you can guarantee a solid few hours for a gym session. If you’re a stay at home parent and have children with you most of the time, know that fitness can be flexible. Every little really does help, so even a workout split into 3x 10 minute sections is great! The key to making fitness effective in small chunks, is PLANNING AHEAD! Write down your targets for your session. I start by splitting my training into three sections, ‘upper body, lower body and core’. Often my children need something in between sets, meaning I have to stop and pick up where I left off a few minutes later. THAT’S OK! When it comes to exercise there are no hard and fast rules. In fact, interval training is a great approach for weight-loss, so aim to raise your heart rate a little during each section. Remember, if you need to stop completely whether it’s due to a nappy over-flow, waking baby or toddler tantrum, don’t worry. Stop the workout completely and try again the next day. If you’ve been following me for a while you’ll know I’m a huge fan of at-home workouts. If you don’t have the time to head to the gym, you can get an equally effective workout at home! I’ve been known to use chairs, skipping ropes, benches, footballs, even water bottles to add variety to my home fitness programmes. Exercise doesn't need to mean standard press ups and burpees. Mix it up, get creative and most importantly have fun! This one is personal and perhaps you’re reading this right now shouting at your computer screen, but for me, early morning workouts really are the best! Exercising early is a great way to kick start your metabolism and boost your energy throughout the day. For parents with very young babies, the morning nap is a great time to exercise (roughly 9.30-10.30am). Personally, I get up even earlier then this. If you have a partner at home early morning, try alternating days for exercise. In my house we wake up at 6.30am and with my husband leaving for work at 7.30am, we have a good hour/ 45 minutes to fit in a quick run and stretch to start the day! We’ve covered how to split your session but when it comes to finding the right time, I tend to look at a schedule on a weekly basis. As most parents can attest, a ‘routine’ is something rarely associated with family life. Every day is different and certainly the weeks tend to change constantly! I use Sunday evenings to look at the week ahead and find 3 times where I can schedule in a session, plus an additional ‘plan B’ option. This makes it much easier moving forwards to stick to my goals. There’s a famous saying to ‘start as you mean to go on’ and while this is good advise for a positive mental approach to fitness, when it comes to individual goals, make sure you give yourself a realistic target and enough time to achieve your aim. This is not to say you should lower your expectations. You are capable of what you set your mind to, so by all means have a big end goal, however be sure to have smaller targets along the way. CELEBRATE those successes, no matter how ‘small’ they may seem. Don’t compare yourself to anyone else and be proud of your achievements! Success is a brilliant motivator, so allow yourself the chance to be proud of your work and appreciate your progress. Prenatal women are being encouraged to love their bodies and celebrate it's incredible strength and natural ability during the trimesters. Staying active during this time is being embraced, with many women approaching labour feeling confident and strong. However, as much as being pregnant certainly does NOT mean being powerless, it's important to remember that when it comes to being a target of assault, a pregnant woman could still be considered 'vulnerable'. StrongLikeMum teamed up with the incredible Eve Torres-Gracie, Head Instructor at Gracie Women Empowered self-defense program, 3x WWE Divas Champion, actress, wife and mother! Getting a healthy balance of nutrients, vitamins and minerals is always important especially during pregnancy. Smoothies are brilliant as they can be adapted to meet all increased fluid and nutrient needs, prevent any unwanted symptoms and cure a sweet craving all at the same time! But not just any ingredients will do the trick and what you put into your smoothie to get the correct balance is so important! Pregnancy can have a huge effect on your posture, which can result in numerous aches, pains and discomfort. We help with some top tips on how to release back ache and improve your pregnancy posture. Hi Mama's!!! It's Becca here and have I got another delicious recipe for you today! If you’re active pre-pregnancy, chances are you’ll be hoping to continue an active lifestyle during the three trimesters. Once the morning sickness wears off ( woooohoooo)! you may find you have enough energy to lace up rather the rest up. But how to adapt your training during this time? Here’s a few things you can expect from running when you’re expecting. IT'S BECCA HERE AND I'M BACK WITH ANOTHER FAMILY RECIPE FOR YOU ALL! Running on empty? Here's 5 Energy Boosting Tips! Ever feel like you’re running on empty? I certainly have days like that... where you wake up and from the minute your feet touch the floor you feel like you’re chasing your tail. There just aren’t enough hours to get everything done, but in the same moment time drags and you feel exhausted and slow? Well, I’ve had enough of those days and earlier this year made it my focus to find 5 ‘set me free’ tricks to combat this! I hope they help you like they have me!! I’m running 10km tomorrow. That’s the longest I’ve ever run in my life. People usually stare at me in disbelief when I say this as I'm generally considered a 'runner', but running events aren't all the same... and I promise, I am NOT a natural long distance runner. In my opinion, long distance runners are a little crazy. Why draw out the uncomfortable ache of running for hours when you could be done in seconds? Anyway, somehow I find myself on the eve of what I consider to be a marathon. Now, I can't say how real long distance athlete's prepare but here are my five MUST DO activities before race day! As a sprinter, many people think you're lazy. While long distance runners can be seen going endlessly round the track, you’ll often find sprint groups huddled indoors resting for 10-15 minutes after a quick 300 sprint. But this ‘lazy’ nature is not why I put 'mentally prepare' at the top of the list. Ok ok, I’ll admit it, physically preparing for a 10km scares me and although serious endurance athletes will of course train for an event I decided to skip that stage this time and just ‘wing it’… ( tune in tomorrow to see how that goes)! Anyway, mentally preparing for a race is so important! Getting yourself in a positive mindset. Replace nerves with anticipation and excitement! Enjoy the thrill of testing your physical abilities. Know that you’ll give it the best you’ve got and that’s the perfect amount! RELAXED RUNNING is hammered in to you as a sprinter and I plan to adopt that mindset for tomorrows adventure too! I’ve talked about foam rolling before on this blog and that is key before race day. 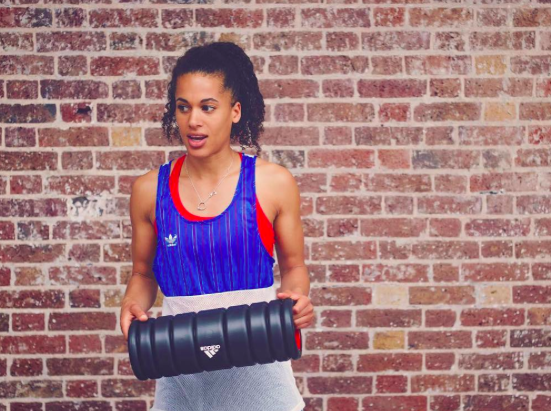 To put it plainly tight muscles won’t perform efficiently so get out your foam roller! For more reason’s on why and HOW check out my previous post here. My second tip for physical prep is all about Human Tecar. This is my go-to pre-race treatment. They have a great sports massage cream but if that’s not for you then grab a bottle of Arnica oil ( oil, not cream) and gently massage those tights spots in your quads or calves! The ‘boring’ bit as far as I’m concerned! But honestly nothing kills race-day like panicking about a lost train ticket or missing sports kit! Get it all laid out the day before. I write list's of all the food I’ll need to take and prep everything in the fridge. Remember to pack your race kit and water bottle, as well as planning out your travel journey and give yourself plenty of time! Carb loading. You’ll here marathn runners talking about this and as it feels like that distance to me I’ll be doing the same. Carbohydrates are crucial for long lasting energy so make sure to maintain a healthy diet pre-race day! Similarly, lean protein and healthy fibre is also key! In addition, don’t forget to HYDRATE! Dry mouth is a bugger for 400 meters let alone 10km! Now some people choose not to run to music but I generally don’t associate with them. They’re crazy. For me Music is a motivator so spend some time planning out a killer playlist for the event. And if music isn't your thing maybe download a good podcast ( or perhaps a Harry Potter audio tape… which is definitely not on my playlist… ahem….. I wonder what happens after Dolorous Umbrage ban's Potter from quidditch)…..
I’m writing this blog post at 11.50pm. Rio’s just had a melt down because he’s rolled out of bed and duty fell on me to get him back to sleep.... five renditions of Paw Patrol later and I’m wide awake, at midnight. We’ve all had those mornings where we’ve been sooooooo rushed off our feet that the idea of sitting down for a bowl of cereal is far from our minds. It’s 2017 and that means everything is ‘on demand’ or ‘instant’ and breakfast just doesn’t seem to fit the mould! People seem eager to slim down but amongst the diets fads and protein shakes no one seems to be stating the obvious; Eat well and exercise more. ‘Playing’ is a word often associated with kids but did you know that according to leading psychiatrists, Playtime is just as crucial for adults as it is for children! Dr Stuart Brown is quoted as saying ‘Nothing light’s up the brain like play’! and it seem’s he’s not alone. Einstein in his own words stated that ‘Play is the highest form of research’ and, if historical theory’s are correct, there's a reason that Archimedes shouted ‘Eureka’ in his bath, not the laboratory! One of the best things about working with Adidas, since joining the team earlier this year, is undoubtably the incredible people I get to meet along the way. I’m drawn to creativity and as the Adidas hashtag suggest’s, everyone embracing this brand is #heretocreate! This weekend was all about creation and I can't wait to share the event with you now!